Georges Rigassi, the editor of the Lausanne Gazette, is vehemently against the building project and says it is an “insult to good sense and taste”. 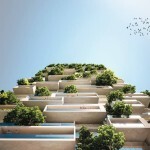 Designed by Lausanne architect Alphonse Laverrière and inspired by New York’s skyline, the 79 metre, 19 floor tower would be Switzerland’s first skyscraper. The building has divided the community and is being opposed for aesthetic, legal, symbolic, moral and religious reasons. 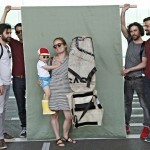 Some object that it will be higher than Lausanne’s cathedral. Others complain of capitalist excess at a time of economic crisis, some are hostile to a project run by German-speaking Swiss. This is news from November 1930 about the Bel-Air Tower in central Lausanne. The building, constructed with a steel frame over the two years to 1932, claimed a fair number of victims. Numerous workers were injured, one even died. Detractors were quick to name it the “Bel-Air necropolis”. Albert Cottier, the initial developer was forced to transfer the project to the Scotoni family of Zurich after his finances deteriorated. Then in 1938 the Scotoni family, hit by the financial crisis, was forced to sell it at a knockdown price to the insurance company La Genevoise. La Genevoise is now owned by the Zurich Insurance Group, the building’s current owner. 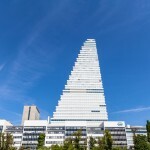 Today the much loved and protected Bel-Air tower in Lausanne’s Flon area is reopening after refurbishment. This time there is no controversy and no moral or aesthetic condemnation. Like the Eiffel tower, which was loathed by many including writer Guy de Maupassant – he reputedly ate lunch in the tower’s restaurant every day so he couldn’t see it, some controversial modern buildings eventually become highly-valued and visible elements of a city’s history. Listed in 1992, La Tour Bel-Air is one of these. The latest refurbishment has taken more than two years to complete. The building was opened to the press on 8 December 2015. Apartments are available to rent from 1 January 2016.